The U.S. Mint’s authorized buyers have purchased this week’s entire 1,036,000-ounce allocation of American Eagle Silver bullion coins in just three days, bringing this year’s overall sales total for the issues to 17,000,000 one-ounce coins sold. This development is particularly striking as the Mint’s weekly allocations have not sold out in recent weeks, and it looked for a moment that the supply of Silver Eagles might finally be starting to outpace demand for the issues. But the value of silver has shown signs of strength this week, climbing to a near six-month high today at $15.98 an ounce, which may have helped increase consumer interest in silver investor coins. As noted previously, Silver Eagles are on pace to surpass last year’s record-breaking total of 47 million ounces sold. The Mint sells its bullion issues to a network of authorized buyers, who then make the coins available to the public. 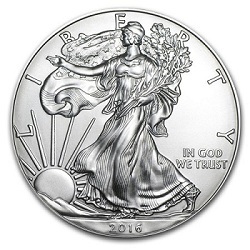 This year marks the 30th anniversary of American Eagle bullion coins, which were introduced in 1986.